Political environments shape the arts. For this reason, it’s important to understand the debates and issues that surrounded and often engulfed both the Jewish and non-Jewish ‘Hitler-generation’ of composers. One of the most crucial of these debates from 1919 was how to preserve the integrity of the German state. The contrasting debate in Austria, however, was how to preserve the integrity of German identity. As I write in ‘Forbidden Music’, to call someone or something ‘German’ and mean ‘from Germany’ is a concept that has only been agreed since 1945. Before then, Germans hailed from far flung corners of Eastern and Baltic Europe, often separated by large swathes of land settled by Slavs, Hungarians or Romanians. This question of what was German also extended to what was ‘Germanic’. Thus many of the more deluded nationalists laid claim to all of Europe’s non-Latin, Magyar or Slavic regions – indeed, many argued that the people of these ‘nations’ should become subordinates to the German people. Cynics reading this today, may wryly suggest that this is, in fact, what has now happened within the ‘Euro-zone’. Not so: prior to the end of the Second World War, no options for a ‘partnership of nations’ were even considered. Pan-Germans saw non-Germans as inferiors. This meant that they were not thought of as potential consumers of expensive German manufacturing; they were intended as a cheap-resource. This question of how to get these widely spread Germans together into a single, political and national unit had vexed Europeans for centuries. When Bismarck’s ‘blood-and-iron’ unification notably excluded Austria with its complex patchwork of Slavs and Germans, Austrian German speakers assumed an alternative pan-German position. They accorded German speaking minorities within the Austrian half of the ‘dual Monarchy’ privileges that left them in dominant positions. This could – and did – cause endless conflicts: throughout Bohemia, Moravia, Silesia, Galizia (Poland); the Bukovina and parts of the Balkans, German was spoken in territorial pockets and rarely in a single large region. One exception to this was the Sudetenland, which is where – as mentioned in a previous article – the composer Arthur Willner was born. This prosperous district spread across Austria’s former Bohemian, Moravian and Silesian holdings and was important to the newly founded state of Czechoslovakia in 1919. To Austrian pan-Germans, it was the cause of ceaseless disruptions and brought down governments at a time when they were trying to establish the remaining rump of the former empire into a viable state. The 1921 Treaty of Lana was thus the pebble in the shoe of Austria’s pan-Germans. The loss of the Sudetenland meant the loss of much industry. They tried what they could to get the new and internationally powerless Republic of Austria to dishonour the treaty, while at the same time ignoring the reality that the only way the newly formed Austrian Republic could gain credibility (and much needed credit), was to accept it and to purchase copious quantities of Czech currency. Not to have done so would have sent the country spiralling into the same mad inflationary hell that Germany suffered. Austrian inflation was bad, but not as eye-popping as Germany’s in the lingering aftermath of defeat. But economic pandemonium was actually what the Entente powers were aiming for. As the accompanying war-time propaganda post-card shows, the break-up of Bismarck’s unification and return to a multi-state German Europe was the overriding ambition of the French. Indeed, it’s tempting to suggest that the French and the Americans ‘won’ the First World War with Europe’s resultant republics rather than constitutional monarchies in place in Germany, Austria and Turkey. Newly formed republics were more fragile without the figurehead of a monarch, as the chaos following the Russian Revolution had demonstrated. Yet even in the worst pan-German nightmares, it never occurred to anyone that German speaking Austria would be separated from Bohemia and Moravia. With the loss of this industrial belt, its Hungarian agriculture and its port in Trieste, the only other option for Austria’s pan-Germans was unification with the German Republic, a state that itself was slowly starting to fall apart. 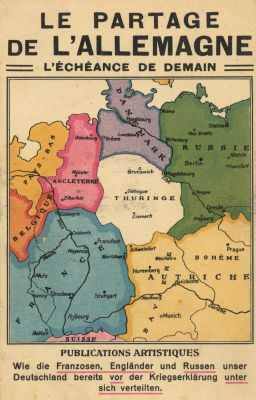 The French anticipated the formation of a separate Rhineland Republic and watched expectantly as other regions broke away (temporarily, as it happened), in order to try and control the economic bedlam. It was in this climate that the composer Franz Schreker believed that unification with Germany was the only survival option for what was referred to as the ‘Austrian rump’. He left Vienna in 1920 for Berlin and was followed by thousands of others – indeed, by so many, that the literary wit, Anton Kuh remarked that he had chosen to re-locate to Berlin so that he could carry on hanging out with Viennese. Yet even in the chaos of post-1919 Europe, the vexing question of where ‘Germany’ was to be located on the European map had not been resolved. Less than two decades later, the disastrous Munich agreement underlined this dilemma. With genuine arguments of Czechs discriminating against German speakers, Chamberlain negotiated the hand-over of a region of Czechoslovakia to Germany without bothering to consult the Czechs. If German speakers felt themselves disadvantaged by the Czechs before 1938, it was to be nothing compared with what followed. Almost all of Czechoslovakia’s Jews were German speakers and many found their Czech citizenship rescinded. German theatres and opera houses were closed in Prague and Brno. Britain was left with the unintended consequences of offering immigration possibilities to Hitler’s Sudetenland political opponents, while according the Jews from the region, who were seen as non-political, a lower refugee-status. In this context it is easier to understand why in war-time, the BBC classified Arthur Willner as a ‘German composer’. Under the 1938 Munich accord, all German speakers from the Sudetenland were German and from 1939, there was a ban on broadcasting copyright German composers. That he was Jewish was not an ‘official’ factor for consideration at this point. On the other hand, Willner avoided British internment as an ‘enemy alien’ based on his claim that he was Czech. The solution of where to locate Germany on the European map was only found with the largely hushed-up ‘ethnic cleansing’ of all Germans from Czechoslovakia, Poland and Russia following the Nazi defeat in 1945. It was one of Stalin’s most heinous war-crimes, but it at least contained the nationalist amoeba that once had split and divided itself over most of Eastern Europe. Perhaps a million or more died on these forced marches to the West (and from East Prussia, to the South) and little sympathy was available for the physical and emotional hardships ‘ethnic Germans’ had to endure; but it was only from then that ‘German’ could clearly mean ‘from Germany’.